Enter the digital age, where lines of code and terabytes of information determine who has the tactical advantage. Of late, the pendulum has swung in favor of cyber-attacks. Rate-based technologies, once considered adequate to handle the most advanced distributed denial-of-service (DDoS) threats, have fallen obsolete as tech-savvy adversaries move beyond the static concepts of most conservative corporate budgets and know how to overcome name-brand mitigation technologies. These ultra-adaptive hackers have given rise to the top five nastiest attack techniques in 2017. It becomes clear that APDoS requires an array of technologies to stop the network floods, HTTP application-level DDoS and encrypted threats. Moreover, Radware is witnessing these attack techniques manifest into SMTP attacks (a relatively new vector) and secure-SMTP such as TLS over SMTP. The task is daunting and real. 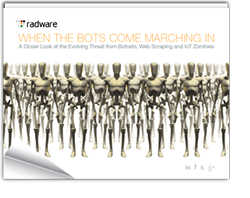 As the next generation of DDoS threats emerge, organizations must be diligent and proactive. Companies must rise above the normal corporate culture of security controls and become obsessive about removing risks and compulsive about action. After all, these organizations may literally be holding life and death decisions in their hands – and this makes their actions rather profound and very unique. A DNS NXDOMAIN flood attack, which is also known as a water torture attack, targets an organization’s DNS servers. This type of attack involves a flood of maliciously crafted, DNS lookup requests. Intermediate resolvers also experience delays and timeouts while waiting for the end target’s authoritative name server to respond to the requests. These requests consume network, bandwidth and storage resources. They can also tie up network connections, causing timeouts. To counter this resource-draining threat, organizations should monitor their recursive DNS servers, keeping a keen eye for anomalous behavior such as spikes in the number of unique sub-domains being queried or spikes in the number of timeouts or delayed responses from a given name server. Mitigating high rate of DNS packets – The tool must be able to challenge large amounts of DNS queries per second and to process up to – often in larger circuits – 10- 35 million packets per second of attack traffic. The attack traffic does not affect legitimate traffic while under attack. There is a new set of challenges facing organizations leveraging encryption technologies. Cyber-attacks, including DDoS attacks and advanced web application attacks, continue to plague businesses as they continuously shift operations online. For both types of assaults, those leveraging encrypted traffic as an attack vector are on the rise, further challenging current security solutions. Most mitigation technologies do not actually inspect SSL traffic, as it requires decrypting/encrypting traffic. Recent surveys show that between 25% – 35% of enterprise communication sent via an LAN and WAN is SSL-encrypted traffic. Encrypted SYN Floods: These attacks are similar to standard, non-encrypted SYN flood attacks in that they seek to exhaust the resources in place to complete the SYN-ACK handshake, only they further complicate the challenge by encrypting traffic and forcing resource use of SSL handshake resources. HTTPS Floods: These attacks generate floods of encrypted HTTP traffic, often as part of multi-vector attack campaigns. Compounding the impact of “normal” HTTP floods, encrypted HTTP attacks add several other challenges, such as the burden of encryption and decryption mechanisms. In the same way SSL and encryption protect the integrity of legitimate communications, they effectively obfuscate many of the attributes used to determine if traffic is malicious or legitimate. Identifying attack traffic within encrypted traffic flows is akin to finding a needle in a haystack . . . in the dark. Most cyber-attack solutions struggle mightily to identify potentially malicious traffic from encrypted traffic sources and isolate that traffic for further analysis (and potential mitigation). The other major advantage that SSL attacks offer to attackers is the ability to put significant computing stress on network and application infrastructures they target. The process of decrypting and re-encrypting SSL traffic increases the requirements of processing the traffic, in many cases beyond the functional performance of devices used for attack mitigation. In a recent report, Gartner Research notes that less than 20% of organizations using common security technologies (firewall, IPS) are inspecting inbound or outbound encrypted traffic. Stateless mitigation: As previously mentioned, many security technologies are stateful in nature, meaning they maintain state throughout a session. This requires additional computing resources and poses the risk of filling session tables, at which point the device will fall over. Be sure the technologies you’re depending on for encrypted attack protection are stateless in nature to ensure ability to scale to the higher demands of these attacks. Asymmetric deployment options: Most security technologies rely on a symmetric deployment model, meaning they are in the path for both inbound and outbound traffic. This has key benefits for some aspects of security, but in the case of encrypted attack mitigation, adds unnecessary computational strain on the solution. Look for DDoS attack prevention technologies that can support an asymmetric deployment where only ingress encrypted traffic passes through the mitigation engine. Certificate management: Some security technologies that claim to cover encrypted attacks do so at the burden of operations teams that manage server certificates. Specifically, these technologies require the sharing of the actual web server certificates, meaning any change to these certificates have to be replicated in the security solution. Look for a DDoS service that can manage the inspection of encrypted traffic through use of certificates legitimately issued to the organization but not tied specifically to the web server. Ensuring integrity of the trust model: One of the principles behind website authentication through certificates is the confirmation to the end customer that they are engaged in a “private” communication with the intended organizations. Some service providers offer SSL capabilities that break this trust model and actually initiate a secure channel between the unknowing end user and themselves. In so doing, they essentially dup the end user into trusting them with the shared information (as well as the service provider’s certificate management). Optimizing legitimate user experience: As is so often the case, IT and security professionals are left to strike a balance between having lightweight security and creating such a locked-down user experience as to chase away customers. This balancing act plays out in encrypted attack mitigation as well, where some technologies employ something of an on/off switch for decrypting all encrypted traffic when a potential attack is detected. Look for technologies that can selectively apply challenge-and-response specifically to traffic identified as suspicious, thereby maintaining user experience for legitimate users sending through encrypted traffic. To learn what #4 and #5 are in this list of the top DDoS attacks and how to mitigate them, stay tuned for Part 2 of this series. Hi Carl; Appreciate the document and looking forward for Part-2. Would you please more precise on “Encrypted Web Application Attacks” with some current attacks data and best practices to mitigate the same. Previous PostCodeFork hackers fooled many security solutions. How about yours?